Grave/Memorial Reference:	A. L2. 1426. Section A is one of the older parts of the cemetery and unfortunately, as can be seen in the first photo on this thread, many of the stones have fallen. 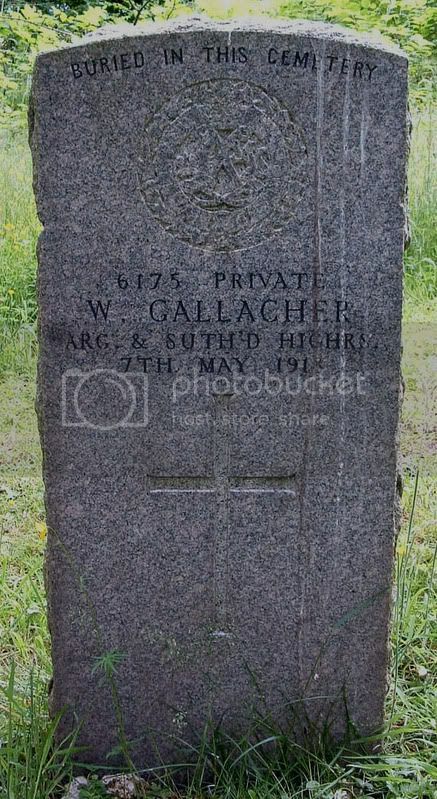 Hopefully Driver Bain will eventually have a CWGC stone as this one I wouldn't imagine will be legible for very much longer. 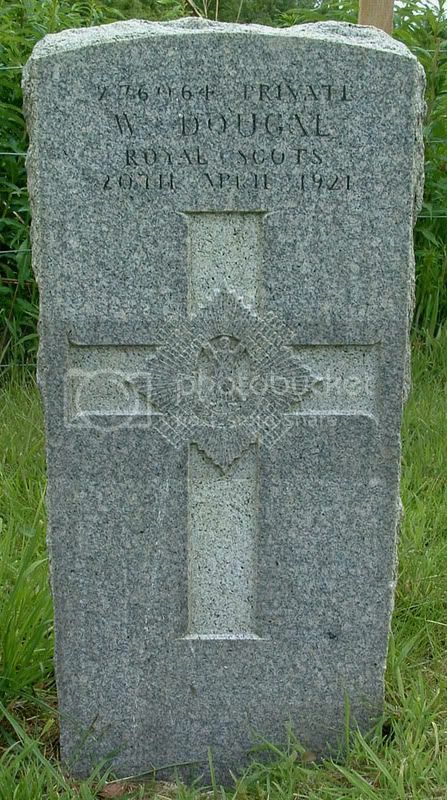 Additional information:	Son of David and Elizabeth Miller Barr, of Waterside, Kirkintilloch. Grave/Memorial Reference:	Sec. C. Plot B. Grave 246. 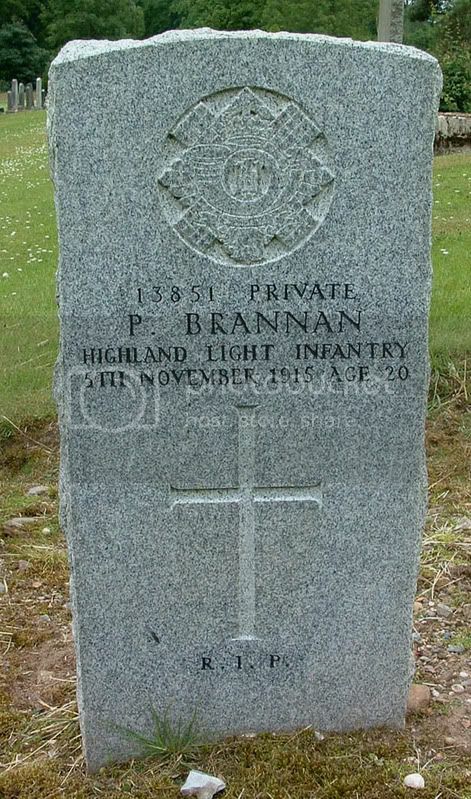 Additional information:	Son of John and Bridget Brannan, of 19, Hillside Place, Kirkintilloch. 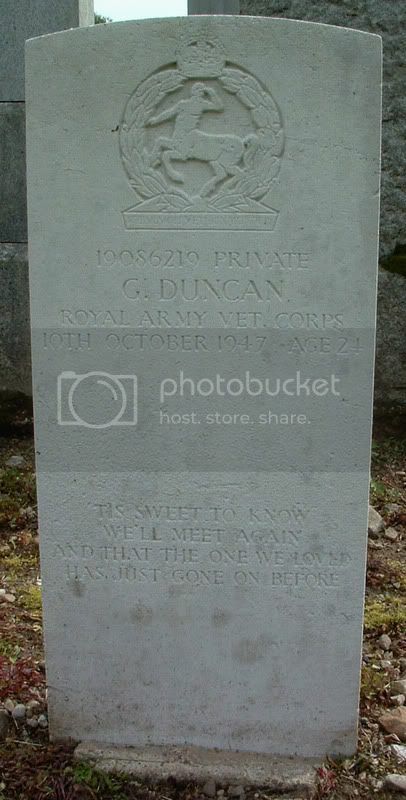 Grave/Memorial Reference:	D. J. 9. Additional information:	See WEIR, the true family name. Additional information:	(Served as CLARK). Son of James and Isabella Stirling Weir. Born at Glasgow. 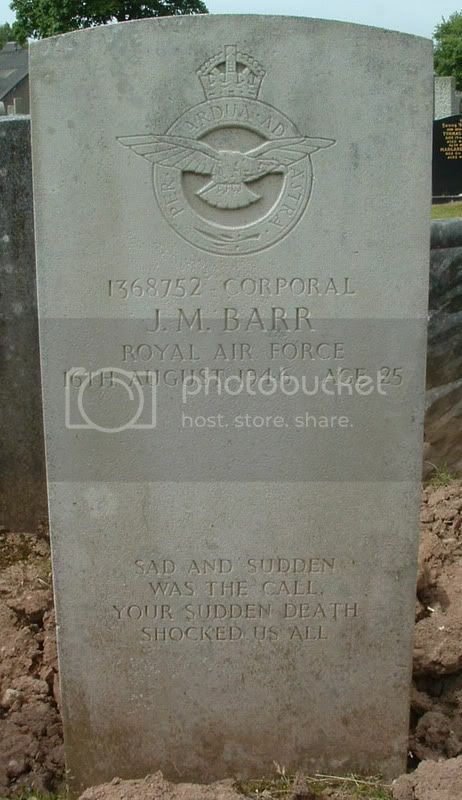 This stone is one of 4 'Special Memorials' - e.g. 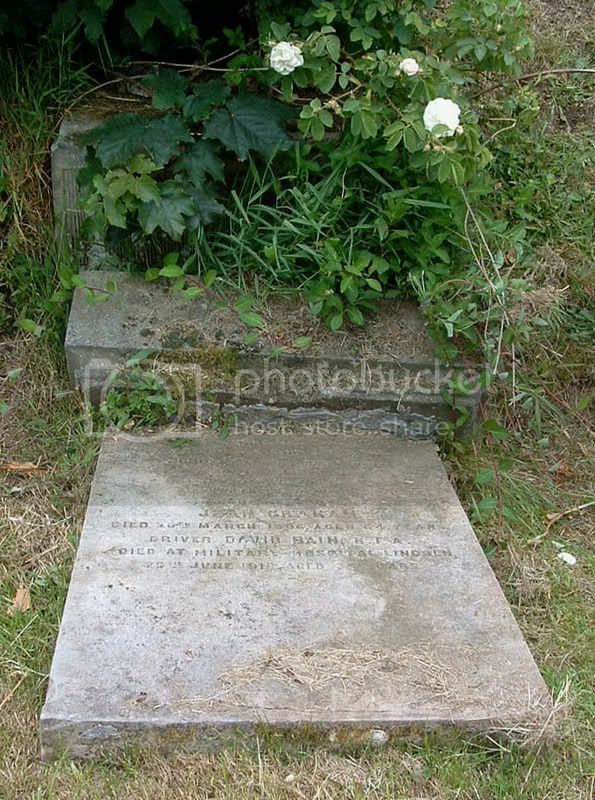 the men are known to be buried somewhere in the cemetery, but the stones do not mark their graves. All four stones are tucked away in a corner at the foot of Section A. 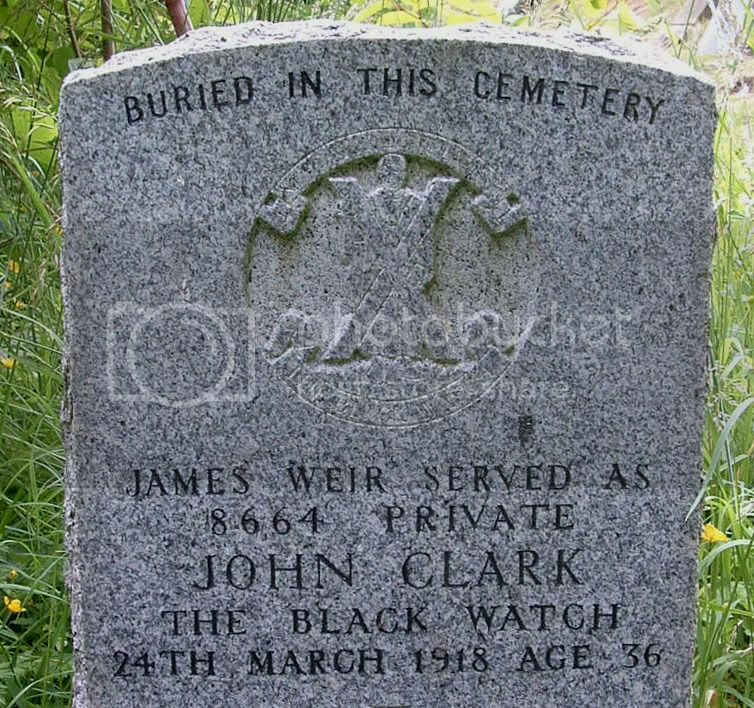 Why Private Clark/Weir's stone has been left to become so overgrown is a mystery when the 3 others have the grass cut short round them. 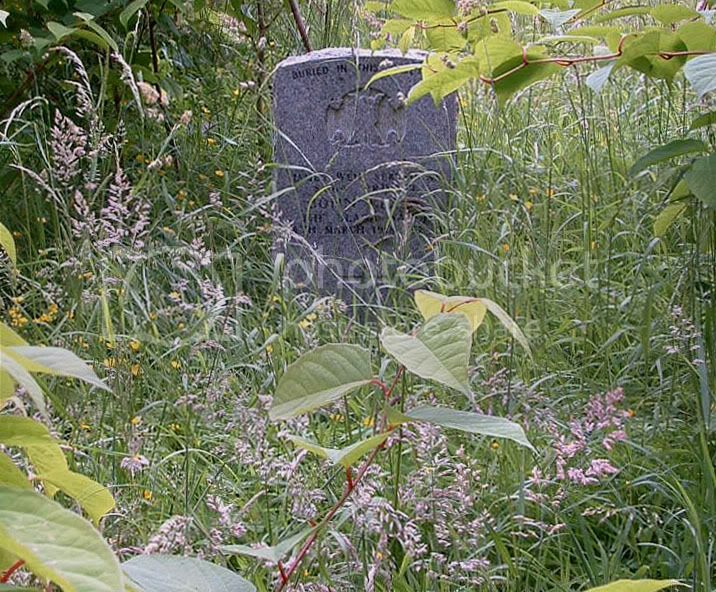 Added: Having spoken to the Cemetery Staff, I enquired why this grave was so overgrown. It seems that they have been instructed not to cut back the grass/knotweed surrounding it as it comes back worse and thicker than ever. Plans are underway to use a glyphosate weedkiller shortly to attempt to solve the problem. 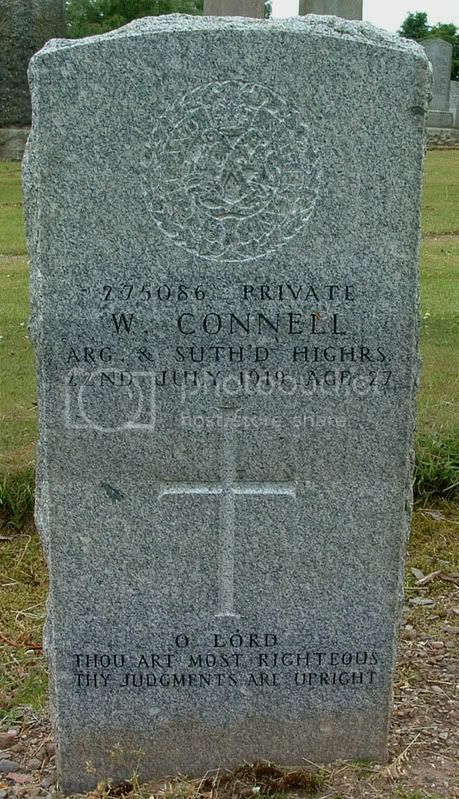 Additional information:	Son of William and Margaret Hendry Connell, of 5, Kerr St., Kirkintilloch. Grave/Memorial Reference:	C. D. 452. 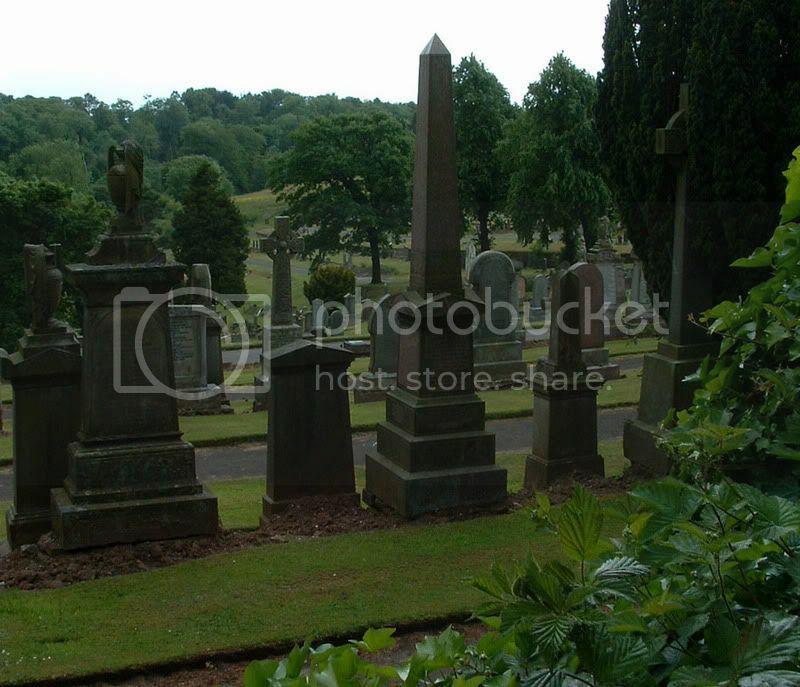 Additional information:	Son of Mathew Connell; of 17, Campsie Rd., Kirkintilloch. Grave/Memorial Reference:	A. B2. 1570. 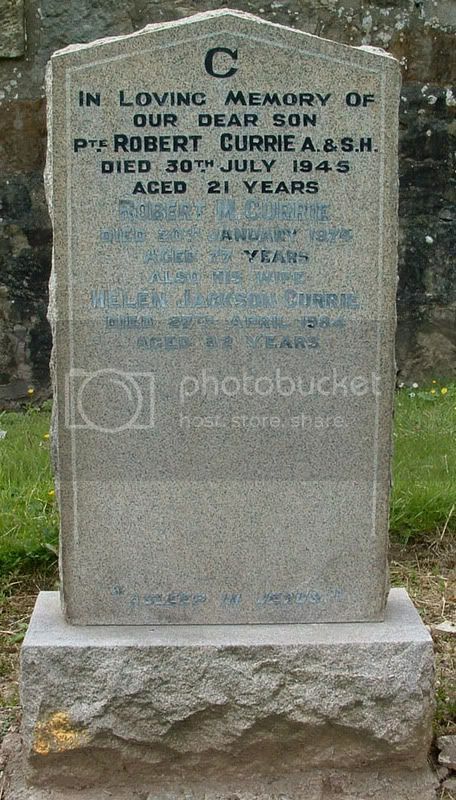 Additional information:	Son of Robert M. Currie and Helen Currie, of Kirkintilloch. Grave/Memorial Reference:	Sec. C. Plot E. Grave 296. Additional information:	Son of John and Lena Dickson, of Kirkintilloch. Grave/Memorial Reference:	Sec. C. Plot E. Grave 116. Grave/Memorial Reference:	A2. D. 22. 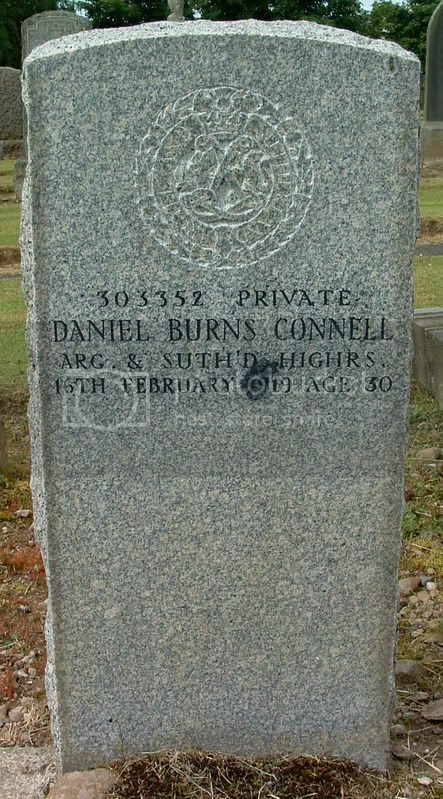 Additional information:	Son of James and Agnes Duncan, of Kirkintilloch. Grave/Memorial Reference:	Sec. C. Plot D. Grave 41A. 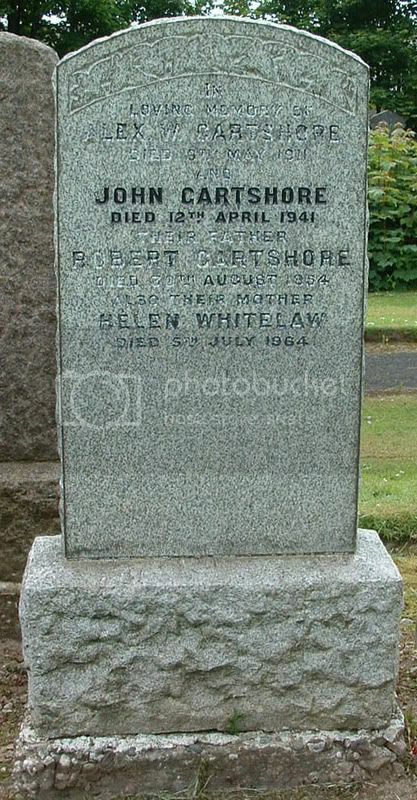 Additional information:	Son of Robert and Helen Craig Gartshore, of Kirkintilloch. Grave/Memorial Reference:	Sec. C. Plot D. Grave 153. 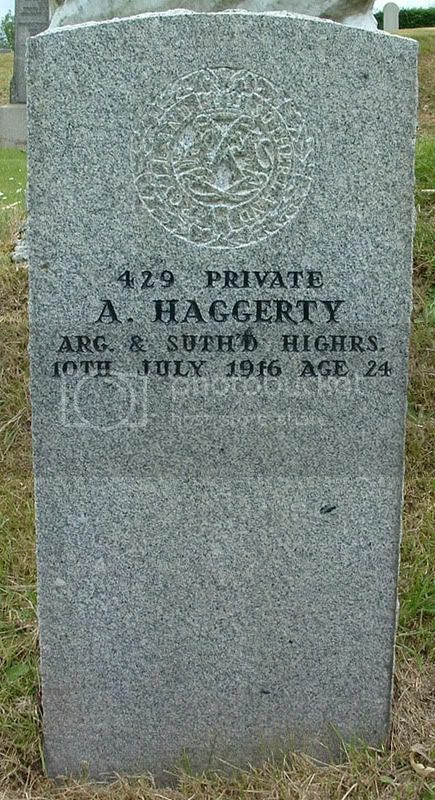 Additional information:	Son of Mrs. Margaret Haggerty, of Montgomery Lodge, Dunoon, Argyll. Grave/Memorial Reference:	C. B. 149. 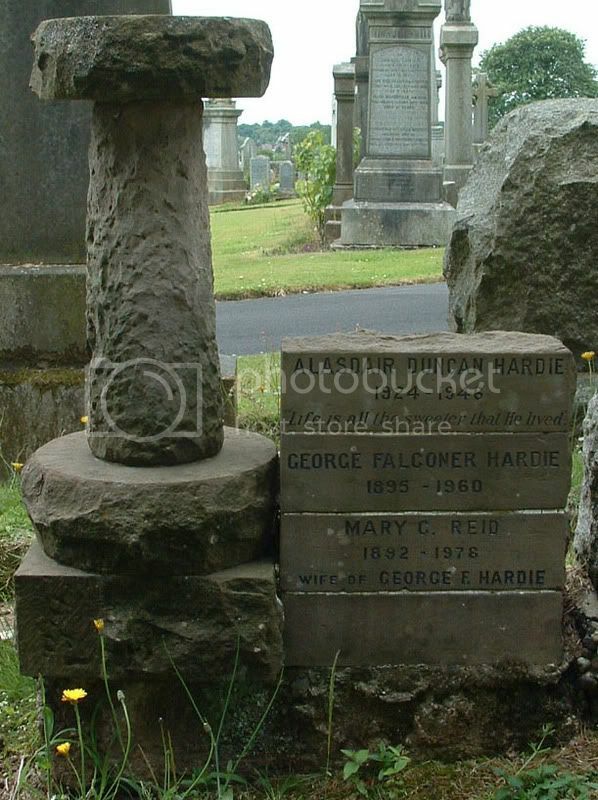 Additional information:	Son of Mr. and Mrs. G. F. Hardie, of Kirkintilloch. Grave/Memorial Reference:	Sec. A. Plot U. Grave 11.